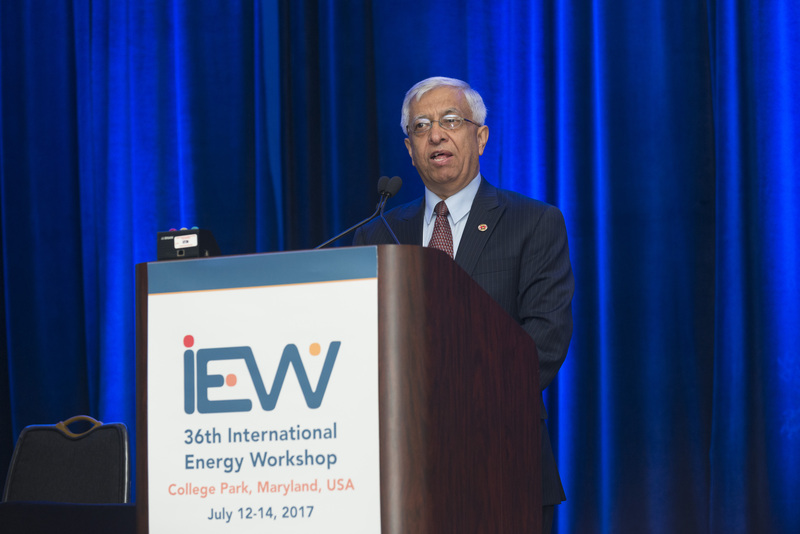 Ghassem Asrar, director of the Joint Global Change Research Institute, speaks at the 36th International Energy Workshop in July in College Park, Maryland. Enlarge Image. Pacific Northwest National Laboratory researchers organized and co-hosted the 36th International Energy Workshop (IEW) from July 12-14 at the University of Maryland, College Park. Drs. Ghassem Asrar, Jae Edmonds, and Leon Clarke of the Joint Global Change Research Institute served as members of the scientific committee and local hosts for the workshop, along with Michael Kintner-Meyer of PNNL's Energy and Environment Directorate and Nathan Hultman from the University of Maryland. The Joint Global Change Research Institute is a collaboration between PNNL and the University of Maryland. A diverse group of nearly 200 engineers, economists, and Earth system scientists from 20 countries attended the workshop. This gathering represented the long-term energy systems modeling disciplines focused on climate stabilization (2100 time horizon) and the electric infrastructure planning community that looks out to 2030. The attendees shared their insights in energy systems, environment, and economics for long-term reliability of grid and other energy infrastructures, and assessments of Earth system changes and their potential impacts and risks to the entire energy system. "The complex scientific and technical challenges associated with energy, environment, and economic security of our nation and the rest of the world require international collaboration and partnership through efforts such as IEW," Asrar said. "We were delighted to serve as the host for IEW in 2017." observe new trends in global energy production and consumption. PNNL's leadership role in convening this international forum speaks to its scientific reputation in the field of global change research and energy systems modeling and analysis.